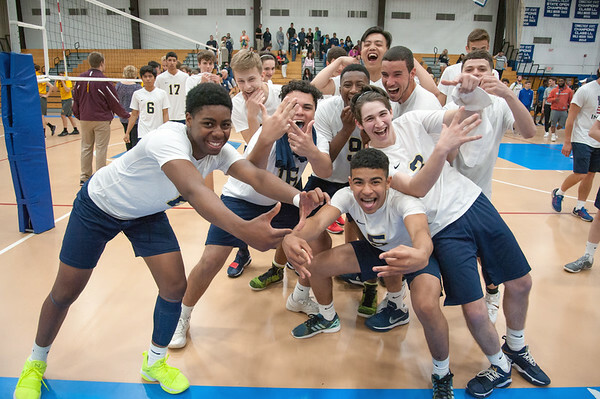 NEWINGTON - As the Newington boys volleyball team boards the bus, their families and friends hop in their cars, it’s once again an early June trip to Shelton High School for the Class M boys volleyball championship. The Indians have competed in three Class M state championships at the Shelton gymnasium and have gone a perfect 3-0. Tonight at 5 p.m., against No. 3 Joel Barlow, Newington will try to make it 4-0 for its fifth title in seven seasons. It all started in 2012, when the Indians defeated Oxford 3-1. Two years later, Newington was back in the title game at Shelton and defeated Oxford again, this time 3-0. Then in 2015, the Indians repeated as champions with a 3-1 victory over Joel Barlow, sparking a rivalry in the postseason between the two. Over the past three state tournaments, the teams have met with Newington leading 2-1. After the Indians took the 2015 title, they and the Falcons split semifinals matchups over the next two seasons. Newington won 3-1 last year in the semifinals to reach the finals. In 2016, Barlow swept Newington 3-0 in the semifinals. The top-seeded Indians have had plenty of challenges along the way. After receiving a bye in the first round of the state tournament, they went on to beat Farmington 3-1 in the second round and South Windsor 3-0 in the semifinals to reach the state championship for the sixth time in the past eight seasons. In order to beat the Bobcats, the Indians got a big jolt from junior Teddy Fravel, who has been strong in his first season in a starting role. Fravel had eight kills and four blocks in the semifinals and will look to make his mark on an even bigger stage tonight. Some other big players for Newington to watch out for tonight will be its all-conference players Leonel Caceres, Louis Egbuna and Daniel Cloutier. Egbuna contributes much of the team’s success over the years to coach Burns. Burns has made it a mission to go out and recruit athletes in other sports he sees as a strong fit to be part of the winning tradition the boys volleyball team has established. As the final spring team from the area remaining, the Indians also know their crowd will be swarming the court with their loud chants. Joel Barlow has yet to win a state championship so the Indians will be in for a battle but as the top seed are the favorite to win. Adding a fourth in the same gym and the fifth title in total will make that long ride back another joy ride for Newington. “It’s a long ride [down there], but we’ve done well,” Burns said. Posted in Newington Town Crier, Newington on Wednesday, 6 June 2018 19:53. Updated: Wednesday, 6 June 2018 21:17.